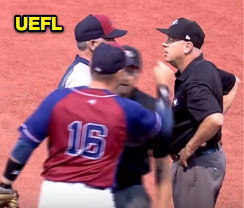 1B Umpire Stewart Howe ejected Melbourne Aces 1B Luke Hughes (safe call; QOCN) in the top of the 4th inning of the Aces-Geelong-Korea game. With two out and none on, Korea batter Yong-Wook Lee hit a ground ball to Aces second baseman Ryan Dale, whose throw to Hughes pulled the first baseman off the bag such that he attempted to re-tag first base after catching the ball, as the runner arrived. Replays indicate Hughes' left foot made contact with the inner edge of first base prior to Lee's left foot arriving at the front edge of the base, the call was incorrect. At the time of the ejection, the Aces were leading, 6-5. The Aces ultimately won the contest, 18-12. 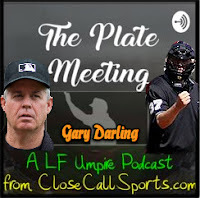 In this seventh episode of The Plate Meeting, a LF Umpire Podcast from Close Call Sports, 28-year MLB veteran crew chief Gary Darling joins the show to discuss his officiating career, UMPS CARE Charities, umpire nicknames, and answer some of your questions. Click the below "play" button to listen to Episode 7 - The Charitable Gary Darling, or visit the show online at https://anchor.fm/the-plate-meeting. The Plate Meeting is also available on iTunes (Apple Podcasts), Google, Spotify, Stitcher, TuneIn, and several other podcast apps. Alternate Link: Episode 7 - The Charitable Gary Darling. The following section contains relevant links, notes, and additional material that correlate with conversations during the show. Click the following related video/article links to be taken to that relevant item. The Plate Meeting is brought to you by OSIP, where Outstanding Sportsmanship Is Paramount. Related Video #1 (15:00): Cubs and Padres clear the benches after Andre Dawson is hit in the head. Related Video #2 (17:00): Warnings issued after Prince Fielder beanball in Game 1 of the 2011 NLCS. Related Link (29:00): ML Umpires Association settles lawsuit against Lou Piniella for defamation. Related Link (51:00): UMPS Care Charities (UmpsCare.com). Related Video #3 (59:15): Gary Darling accidentally spits gum on Bobby Valentine during argument. Related Video #4 (1:06:30): Bill Hohn ejects Bobby Cox and Brian McCann in Florida. Related Video #5 (1:08:40): 3B Umpire Gary Darling calls "Time" during 2011 NLDS. Related Video #6 (1:11:45): 2013 Detroit-Oakland ALDS features bench clearing. Related Video #7 (1:14:15): Hawk Harrelson goes on a rant about obstruction against Chicago. Related Video #8 (1:36:00): Darling rings up Punto in the NLCS (Yes, it was in the strike zone). Related Link (1:39:00): Real 'Fake Umps' Return on Sunday Night Baseball, Aug 2 (7/27/15). Related Link (1:57:00): Sign-Up for the January 2019 UMPS CARE Golf Classic. Follow us on Twitter 🐦 (@UmpireEjections) and like on Facebook 👍 (/UmpireEjections).